It’s not hard to find TV shows to watch these days. But finding good ones to watch amid all the streaming video services fighting for your attention and your eyeballs? That’s more of a challenge. We’ll help you separate a would-beHouse of Cardsfrom the rest of the pack, as we look at which streaming TV shows are worth your time. These days, Adult Swim provides bizarre cartoons from a variety of sources. 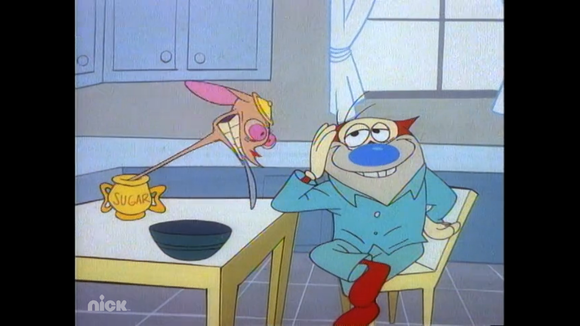 But back in the 1990s, everything weird and gross in animation flowed from one source: The Ren & Stimpy Show. And thanks to Hulu Plus, you can live the dream of every 1992 dorm room and watch the first three seasons whenever you want. It’s quite a change from the days when people had to suffer through whatever Nickelodeon was airing the other 23-and-a-half hours of the day. It was probably Clarissa Explains It All and Rugrats. Ren is an asthmatic Chihuahua who talks like Peter Lorre. 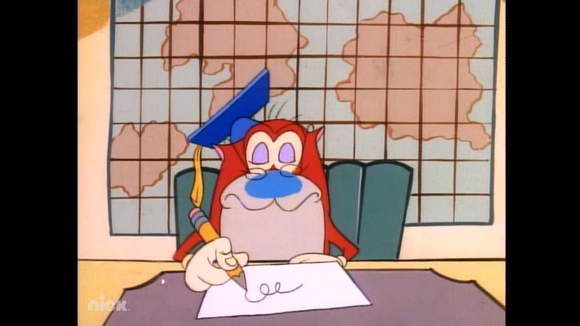 Stimpy is a dumb cat who talks like Larry from the Three Stooges. Ren shouts at Stimpy while bizarre things happen. Along the way, there are secondary characters like Mr. Horse and Muddy Mudskipper. Sometimes there’s a commercial for a log. It’s enthusiastically nonlinear and gross in a way that was not at all common for 1991. First, it’s a gorgeous show. Maybe the character designs aren’t traditionally attractive, but there are times when it seems like every frame has been tweaked to deliver the maximum amount of humor. If it would be funnier to replace the regular models with oil paintings, that’s what happens. There’s a general squeaky-clean 1950s tone, only infected with a great deal of bathroom humor. When it debuted in 1991, it was very popular, because it was so unlike anything else on television. It’s also a catchphrase machine, especially in its early seasons. There was a time when you couldn’t go 10 minutes without someone insisting that you not press a red, candy-like button or whiz on an electric fence. There wasn’t much clinging tenaciously to people’s buttocks. At least, not more than at any other time. 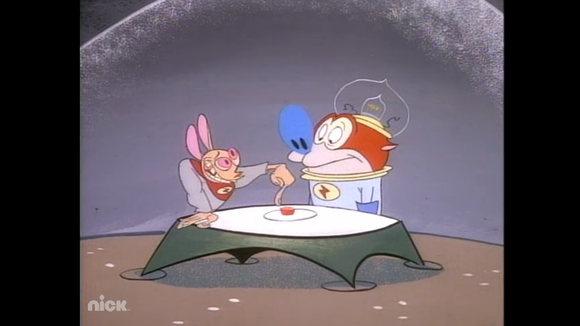 The Ren & Stimpy Show sometimes goes for grossness over comedy. Or it might be that the guiding aesthetic of the show is that grossness is the same thing as comedy. If you’re in the right mood, that’s not entirely incorrect. If you’re not in the right mood, you maybe don’t want to see kitty litter being used as food. Or as kitty litter, really. The same goes for randomness: Some things are supposed to be funny because they come out of nowhere. And they are, but when too many random things happen, it stops being funny and just becomes a festival of randomness. Although public tolerance for that sort of thing has gone up a bit since the 1990s. 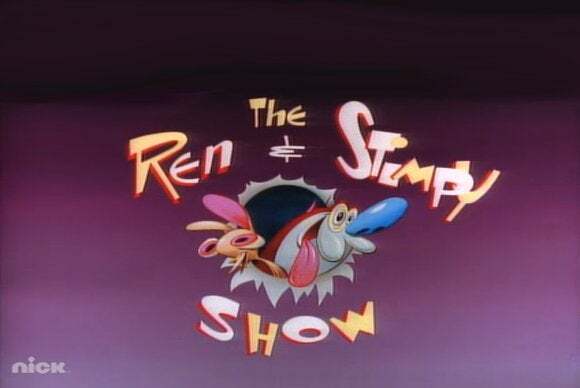 It’s possible that in a world with Tim and Eric in it, The Ren & Stimpy Show will seem completely logical. It’s also a shame that it’s all the creation of the singular vision of John Kricfalusi, who lost control of the show after the first seasons. Nickelodeon apparently wanted a show that was a little less weird, and also that came in on deadline, so they took the show away from him. When Kricfalusi left, his role as the voice of Ren was taken up by Billy West, who had already been doing Stimpy. Kricfalusi now goes by “John K.” and did some cartoons for Miley Cyrus’s latest tour. Even a staunch individualist needs to eat. Luckily, Hulu is only offering the first three seasons, so only the first non-Kricfalusi season is in there. A dog plus a cat plus boogers. Or, as the show calls them, “magical nose goblins.” If you find that funny, The Ren & Stimpy Show will be happy to give you much more of the same. And who are you to not find that funny? “Magical nose goblins” is a funny phrase. It was great in the 1990s, and there’s still no arguing with the high points like the “Happy Happy Joy Joy” song or that time Ren got Space Madness. If you weren’t around then, you should still watch at least some of it so you understand what people liked in the before-time. How many hours should I binge-watch at once? Probably not more than two. You don’t want to overdo something like this, because then you’ll end up walking the streets calling people fat, bloated eediots and you’re bound to get some funny looks. And that way, you’ll have six separate viewing sessions to look forward to. When you’re done, you could try to hunt down the Ren & Stimpy albums and listen to those instead. “Crock o’ Christmas” is even seasonally appropriate, even if they do mostly sing about giving hairy chestwigs for Yak Shaving Day.